Hello crafty friends: This week over at RETRO RUBBER it's Halloween time!!! One of the most fun Holidays in the year so, we want to see your spooky, bewitching, mummylicious creations on our gallery. 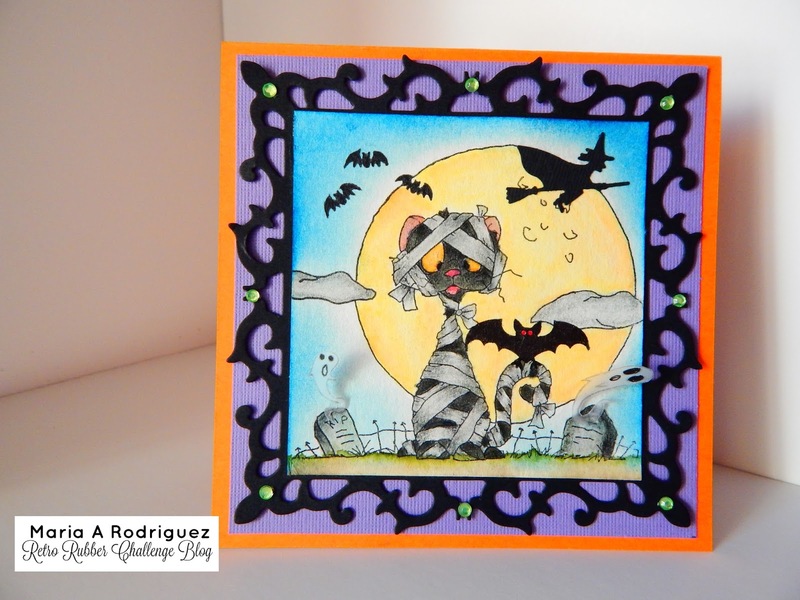 I dug deep into my stash of Halloween stamps and found this one from Whipper Snapper called Mummy Cat, I just love this "spooky" half wrapped mummy kitty, I've had this stamp for at least 5 years. I stamped the image onto a piece of Canson water color paper and made a mask of the moon, so I could sponge the sky with Broken China distress ink. I colored him with SU markers and an aqua painter, adding some Wink of Stella to the ripped strips of cloth. The big bat on the cat's tail is from the bargain bin at my local craft store, the flying witch is punched with a Martha Stewart punch. I die cut the frame with the Fleur the Liz die set from Spellbinders. The ghosts are stamped onto Tracing Paper with Dove Gray Stazon and then fussy cut, it was a bit hard to do this since this paper is super thin but I wanted them to look ethereal and I think I accomplished this. Here is a closer look. I can't help but smile at this "frightening" scene. The sentiment and the spider webs are from Inkadinkado and they've been in my Halloween stash for at least 5 years. Here is our banner to get you in the mood, we can't wait to see your cards in the gallery. Animal Friends Challenge #43, Halloween/Autumn. Must have an animal. Just for Fun Challenge October challenge "Halloween"
Let's Craft and Create Challenge #118 Halloween/Autumn. 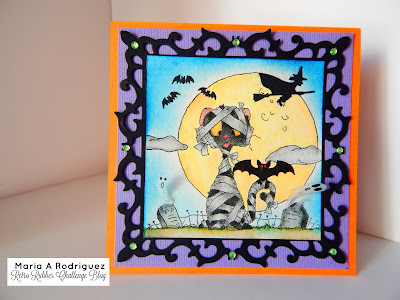 Paper Creators Challenge "Anything Spooky"
Paradise of Stamps Challenge #49 "Halloween/Autumn. Scrap N" challenge September Challenge "Halloween"
Scrap from your Heart #2 "Halloween"
Great scene building with your moon mask! Love the black die cut really cute card! Lovely card. I like the frame and the embellishments. Thanks for joining our challenge at Let’s Craft and Create Good luck!! Oh, this is such a cute halloween card! The die cut frame is awesome and I love the cute mummy cat image. 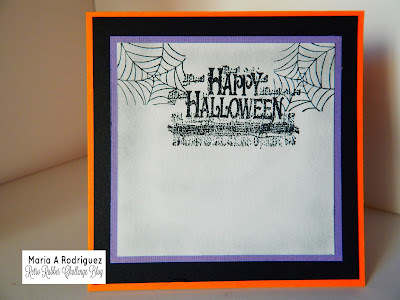 Fun Halloween card! Die Karte ist echt klasse. Danke für die Teilnahme bei den AF. Great card, inside and out! I love all the halloween images and the bold colors! Absolutely adorable, Maria! What a cute image - and your coloring (as always) is spot-on. LOL...fun, cute image and your coloring is amazing! Thanks so much for asking me to be the GD this week! Always love what your team has to offer! This kitty made me laugh out loud. Darling card! Marie, you might try to make a scary scene but your images are always so darling. Great coloring (as Brian said, per usual!) and so much fun!!! I have the Martha Stewart witch punch and never use it anymore. But too cute to give up! Well done, teammate!! Wow! Love all the layers and attention to detail in the fun card. We had the same idea for a cat and a moon scene and yet they are so different! Marie, your card is so adorable. The cat wrapped up in the bandages is priceless! This is such a cute and fun card. What a great scene you created! Thanks for joining the Just For Fun challenge! We hope to see you again. I got a cute image in my mind when I saw your card, Maria. I had recently seen a video of a cat emptying a toilet paper roll and I think your kitty had joined him! LOL Your card is the perfect Halloween card - cute and perfect to display for the season. Love it!! Hi Maria! First I love your blog pic - you look about 30! Your cards always amaze me - true artistry at work - and this one is no exception! Beautiful coloring! Simply wonderful! Your Heart with your beautiful creation :-) Good Luck ! !